With the forthcoming release of the latest incarnation of A STAR IS BORN, I thought I would go back and watch the prior versions to see which had fared better over time, and how the story has subtly shifted to reflect changing mores. In all of the movies, the story is broadly the same (SPOILERS FOLLOW! ): a young talented woman dreams of becoming a star. She catches the attention of a famous older man who has already achieved that fame, and has indeed become jaded by it, falling into a cynical alcoholism. But whatever his own cynicism toward the industry, he believes in the ingenue's talent and wants her to attain that uncomplicated success that he hasn't been able to achieve for himself. They fall in love. She becomes successful. They marry. In a pivotal scene, he drunkenly embarrasses her but she remains loyal to him, even to the point of being willing to give up her career to nurse him back to health. He cannot bear for her to make this sacrifice and commits suicide to allow her to be free. In the famous final scene of the film, she arrives at her latest premiere, announcing herself as "Mrs Norman Maine" in his honour. At least this is what happens in the first two versions of the film - we'll discuss how the third version deviates from it later. 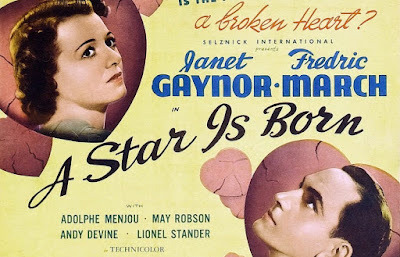 The original 1937 version of A STAR IS BORN remains my favourite and - to my mind - still holds up as a straightforward tragic drama and investigation of the corrupt Hollywood machine. The film's credentials are impeccable. It was directed by William A Wellman (THE PUBLIC ENEMY), based on a screenplay by THE Dorothy Parker, Alan Campbell, Robert Carso. The evocative score was composed by Max Steiner (CASABLANCA) and its technicolor photography was ground-breaking - achieving a more naturalistic feel than its predecessors and winning DP W Howard Greene (THE ADVENTURES OF ROBIN HOOD) the first ever Oscar for a technicolor film. In front of the lens, the film stars Fredric March (THE BEST YEARS OF OUR LIVES) as the tortured actor Norman Maine and the sweetly sincere Janet Gaynor as his discovery, Esther Blodgett. What I love about this version is that there's a real pathos in Fredric March's performance and while Gaynor is earnest she never looks like a pushover. In fact the opening scene of this film has a rather gothic old relative warning her that she'll have to make sacrifices for fame, and though wide-eyed, Esther always seems open-eyed too. This makes her marriage to Norman all the more heroic. What's more shocking is his decision to take such an extreme decision at the end of the film. It's as though he knows she'll never leave him so he has to leave her and allow her to flourish. In that sense, it's the ultimate sacrifice. What I also love about this is that the pure nobility of the act contrasts with what has also been a film about the fickle manipulation of Hollywood - the press agents, the paparazzi, the fakery. And so there's an irony that these two lovers have married under their real names - deemed to ugly to be used in Hollywood -and that even when "Vicky" declares herself to "Mrs Norman Maine" she isn't really at all. Even that is a Hollywood construction. It makes the ending satisfyingly ambiguous or bittersweet. She has become what he hoped, and what she hoped for herself, but she has necessarily compromised herself in the process, as the old woman warned her at the start. The 1937 version of A STAR IS BORN has a running time of 111 minutes. It won the Oscar for Best Original Story and an honorary award for its photography.